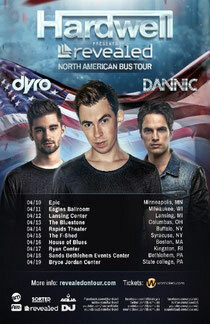 In the run up to the Revealed Recordings’ second North American tour, Hardwell recently revealed the official website for the tour, where he will be joined by long-time Revealed family members Dyro and Dannic on a tour bus that will take in 10 USA venues. The official website will become a central hub and will provide fans with the most up-to-date news on the Revealed North American Tour, allowing them to interact with Hardwell, Dannic and Dyro during the 10 days, with info on tour diaries, pictures, fun facts, games and give-aways. Alongside the website’s social presence there will also be a opportunities for fans to win exclusive prizes and listen to new music and mixes, keep tabs on where the Revealed guys are and check out new photos and videos from the Revealed crew during their tour. Those interested will be able to participate in real time on every stop on the tour as they follow the bus via an interactive map embedded in the site.